There will be more than 50 billion devices connected to the Internet by the year 2020. Not only SmartPhones and tablets are amongst these devices, but almost anything with a sensor on it. For example – coffee machine, automobile, jet engines, wearable tech devices, and much more in the list. This network of devices is called the Internet of Things (IoT). 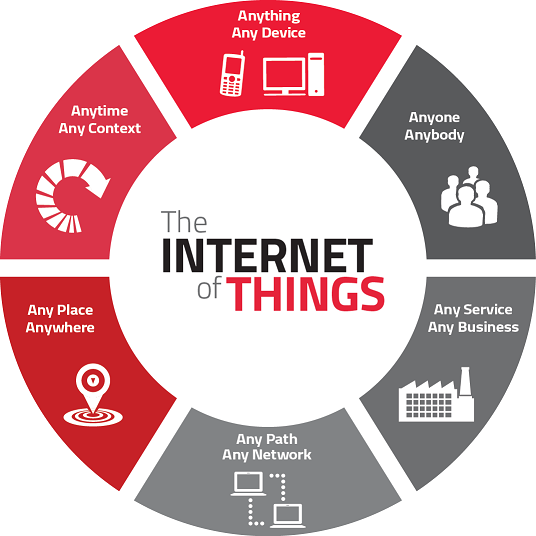 The Internet of Things (IoT) is a scenario where objects, animals or people, all are provided with unique identifiers(IP address) and the ability to exchange data over a network without the need of human-to-human or human-to-computer interaction. Internet of Things has evolved from the convergence of Internet, micro-electromechanical systems, and wireless technologies. In “IoT” ecosystem, a thing can be a human with a heart monitor implant, an animal with a biochip transponder, or an automobile with in-built sensors that alert the driver in case of anything wrong suspected. In simple words, it can be any of the natural or human-made objects that can be provided an IP address. What’s transformative about the “Internet of Things” is not the internet itself, it’s the ever-changing nature of “things” that we create. Connected things are developing new value in ways that were beyond the imagination a few years back. In different areas such as service and innovation, IoT is facilitating new landscapes that will help in invention and growth. IoT provides businesses the opportunity to enable as well as extend digital business scenarios, also help them better connect customers, processes, and other M2M assets. Using IoT businesses can better harness data. IoT revolves around more machine-to-machine(M2M) communication; it’s built on cloud computing and networks of information-gathering sensors. It’s mobile, virtual, and instantaneous connection; and as per the experts “Internet of Things” has all the capabilities that can enable people to make smart decisions & better living. The Internet of Things (IoT) is a vision. It is being built today. There are several benefits of IoT brings into our lives, it can help individuals, businesses, and society by making people’s lives smart & convenient. For individuals, IoT concept can benefit in different forms including health, safety, financially, smart planning for the day and much more. The IoT ecosystem will not only impact people’s lives but the business world alike. Businesses can also reap many benefits from the Internet of Things. For instance, it changes the way customers and companies communicate. Rather than simply meeting for the purpose of selling products or services, the relationship turns into a continuous interaction, which lasts as long as the consumers keep using a product or the related services. SynapseCo took an early strategic step forward into the connected future. As there are more than 12 billion connected devices in the world today, SynapseCo is providing businesses a comprehensive IoT roadmap that helps them transform their business models & operations into the 21st-century enterprise.